The ESA spacecraft Mars Express took this new image of the Phobos-Grunt landing area on March 7, 2010. The insert marks the proposed landing region and sites for Phobos-Grunt. See the full story. Newphotos of the Mars' moon Phobos reveal the Martian satellite as a strange, potato-shapedmoon, and show potential landing zones being considered for a future roboticprobe. Theimages, taken by Europe's Mars Express spacecraft during a March 7 flyby, revealthe rocky Phobos in stunning detail with a resolution of just 14.5 feet perpixel. The new Phobos photos also show the proposed landing sites for Russia's forthcomingPhobos-Gruntmission, which is designed to bring samples of the Martian moon back to Earth. Thenew images follow up on Mars Express' closest-ever flybyof Phobos on March 3. That pass did not yield any pretty pictures, however,as the research experiment ongoing at that time investigated the mass andgravity of the small moon. TheEuropean Space Agency's Mars Express spacecraft orbits the red planet in ahighly elliptical, polar orbit that brings it close to Phobos every fivemonths. It is the only spacecraft currently in orbit around Mars whose orbitreaches far enough from the planet to provide a close-up view of Phobos. LikeEarth's moon, Phobos always shows the same side to its host planet, so in orderto observe its far side a spacecraft must fly beyond Phobos' orbit and lookinward. Mars Express did just that during three flybys on March 7, 10 and 13. Phobosis the larger of the two moonsof Mars. The smaller satellite is called Deimos. Scientistsstill remain puzzled over how Phobos came to be. The Martian moon is notspherical like most moons, and has an irregularly shaped body that measuresabout 17 miles by 14 miles by 12 miles. Phobosappears to share many surface characteristics with so-called carbonaceousC-type asteroids,which suggests it might have been captured from this population. However,it is difficult to explain either the capture mechanism or the subsequentevolution of the orbit into the equatorial plane of Mars. 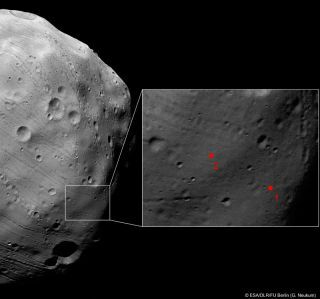 Anotherexplanation for Phobos suggests that it formed around Mars, and is therefore aremnant from the planetary formation period, ESA officials said. In2011, the Russian Federal Space Agency plans to send the Phobos-Grunt (meaning "Phobossoil") mission to land on the mysterious moon, collect a dirt sample andreturn it to Earth for analysis. Foroperational and landing safety reasons, the proposed landing sites wereselected on the far side of Phobos.This region was imaged by the High Resolution Stereo Camera (HRSC) on MarsExpress during the July-August 2008 flybys of Phobos. Butnew HRSC images showing the vicinity of the landing area under differentconditions, such as better illumination from the Sun, remain highly valuablefor mission planners. Itis expected that Earth-based ESA stations will take part in controllingPhobos-Grunt, receiving telemetry and making trajectory measurements. MarsExpress will continue to encounter Phobos until the end of March, when the moonwill pass out of range. During the remaining flybys, HRSC and other instrumentswill continue to collect data.